I grew up on the Jersey Shore. Memories of my childhood are ensconced there, on the beach of Ocean Grove, in the quiet lull of the Manasquan inlet, speeding down Rankin Road in Brielle on my bicycle and hoping to stop before smashing into a giant oak. Girl Scouts, the local park, soccer, softball, piano lessons, Perkins instead of Halloween, church, camping trips, the Pine Barrens, Englishtown. Bagels, pizza, the roar of the ocean every day during the summer after Cream Cheese & Grape Jelly Sandwiches whilst watching The Prices Is Right at my grandmother’s house. The smell of coffee mixed with Entenmann’s topped off with the wafting odor of printer’s ink. So many memories crammed into such a short amount of time. As with all memories, there are good and bad. Death. I lost count of how many relatives crossed to the other side during my childhood. I lost both grandmothers by the time I was a freshman in High School. My first grandmother passed away on a Thanksgiving. Before she passed, she told me to “Be the best you can be. Always.” Perhaps she didn’t use those exact words, I was 11 and had more important things on my mind, but that’s always stuck with me. We moved away from New Jersey when I was 12, almost 13. Truth be told, I was happy to be moving away. A new start. No teasing or bullying. Finally. I could be me. But then I kind of missed it. You see, our house in Jersey was on a dead end street. I got along with the other kids on our street. We played outside, a lot. I was also the only girl. I played Cops & Robbers, tackle football, baseball, Olympics, random games of street-hockey, etc. Life was good on the street, just not at school. The house in Virginia was in the middle of nowhere. Our nearest neighbors were 6 feet underground – yes, a cemetery. Quite a change from suburbia for a kid who was used to going out and playing with the neighborhood kids. I romanticized my time in New Jersey as I grew older. Particularly in college after losing my grandfathers. Any time spent with my paternal grandparents was in Jersey for the most part. I clung to those memories. Their houses, the way they smelled, my grandmother’s elegant clothes she let me wear to play dress up, my grandmother’s amazing cooking, and my grandfather’s massive pines lining his pristine black asphalt driveway up to his green and white Cape-Cod style house. In my head, my memories are trapped in a snow-globe, just beyond a looking glass. Perfect, happy, and never-ending –like old movies stuck on repeat in a theatre. Not only am I aware of the massive destruction she left in her path, I survived the massive storm myself as it passed over Pennsylvania, where I now call home. I meant to go home to Ocean Grove, to Brielle, to Point Pleasant – to eat at Vic’s in Bradley Beach again – to visit friends and family still residing there– before Sandy. I’m still going but it won’t be the same. The looking glass is shattered and so am I.
I keep telling myself Sandy didn’t destroy the memories I hold so near and dear in my head and heart – nothing can do that unless I allow it to do so. In the grand scheme of things, I’m lucky. Our townhouse is still standing, our power was only out for nearly 4 days, and we didn’t have to wait for FEMA or the government to help us. No gas rationing here. I’m grateful. Shaken because all the mourning, all the grieving, everything, has come undone within just a few short weeks and I don’t know how to fix it just yet. I’m shocked and bewildered to have been affected this way. It’s as if Sandy pulled a string on the bag holding all these memories and now I have to catch them but they’re growing as fast as a group of Tribbles. Every time I think I have things under control again, something else pops up. What’s worse is that I’m not sure how to put this into words – not yet. I realize I am but when it actually happens, I struggle to convey how I am feeling because I don’t know. I don’t feel as if I have a right to feel the way I do when so many who still live on the Shore and in NYC are facing so much more loss than I am as a result of Sandy’s vicious attack. I know trauma is in the eye of the beholder. I know. I’m striving to give myself permission for my emotional reaction –once I achieve that part, the rest will be all downhill, just like cruising down Rankin with the wind in my face when I was a young girl. As the Jersey Shore rebuilds –and I know they will because we Jersey folks are a strong breed — I will be rebuilding my memories and working to remind myself no one can ever take them away from me. I will give myself permission to mourn the change and the loss of this tremendous storm. I will continue to move forward and persevere. This entry was posted in life, sad, woman, writing and tagged destruction, Jersey Shore, loss, memories, Sandy, shaken on November 12, 2012 by LHale. Join us as we toss around words we find inspirational and full of hope, even in the dark. Be sure to stay-tuned to the blog for original graphic art featuring the words mentioned in today’s chat! See you on Twitter! 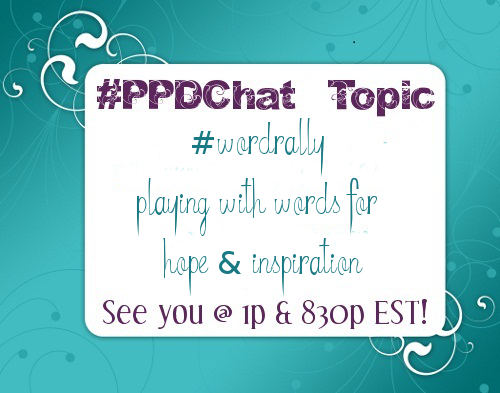 This entry was posted in #PPDChat and tagged #PPDChat, inspiration, postpartum depression, survivor, twitter, word play on November 12, 2012 by LHale. This entry was posted in postpartum depression and tagged #PPDChat on November 5, 2012 by LHale.